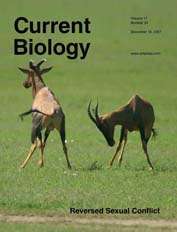 Current Biology is a scientific journal that covers all areas of biology, especially molecular biology, cell biology, genetics, neurobiology, ecology and evolutionary biology. The journal is published twice a month and includes peer-reviewed research articles, various types of review articles, as well as an editorial magazine section. Current Biology was founded in 1991 by the Current Science group, acquired by Elsevier in 1998 and has since 2001 been part of Cell Press, a subdivision of Elsevier. According to the Journal Citation Reports, the journal has a 2014 impact factor of 9.571.